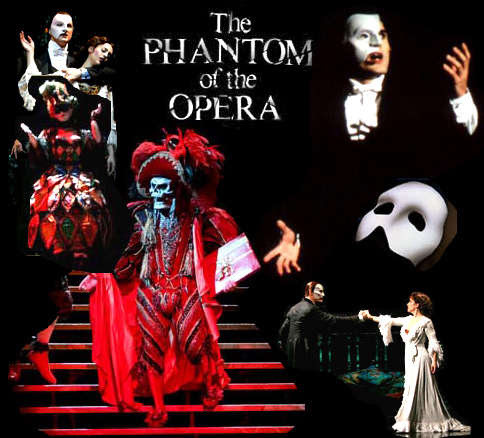 Here's “POOR FOOL, HE MAKES ME LAUGH” LYRICS performed by PHANTOM OF THE OPERA. be sitting in Box Five. available, other than Box Five . . .
are hidden behind the drapes of the bed, which are drawn. Or the old scenery . . . The old singers . . . The old audience . . .
(They chuckle and nod to RAOUL in the opposite box. leave, but shall hide over there to observe her! Serafimo - away with this pretence! Time I tried to get a better better half ! He's here: the Phantom of the Opera . . . It's him . . . I know it . . . it's him . . .
who are the toad . . .
You cannot speak, but kiss me in my croak! Non posso piu . . . I cannot . . . I cannot go on . . .
Cara, cara . . . I'm here . . .
is all right . . . Come . . . I'm here . . .
continue in ten minutes' time . . .
giving you the ballet from Act Three of tonight's opera. Maestro - the ballet - now! flies in. They begin the Dance of the Country Nymphs. Christine, come with me . . .
No. . . to the roof. We'll be safe there. not panic. It was an accident . . . simply an accident .